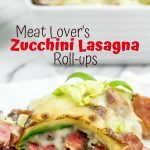 Looking for a side dish that’s rustic and looks impressive? 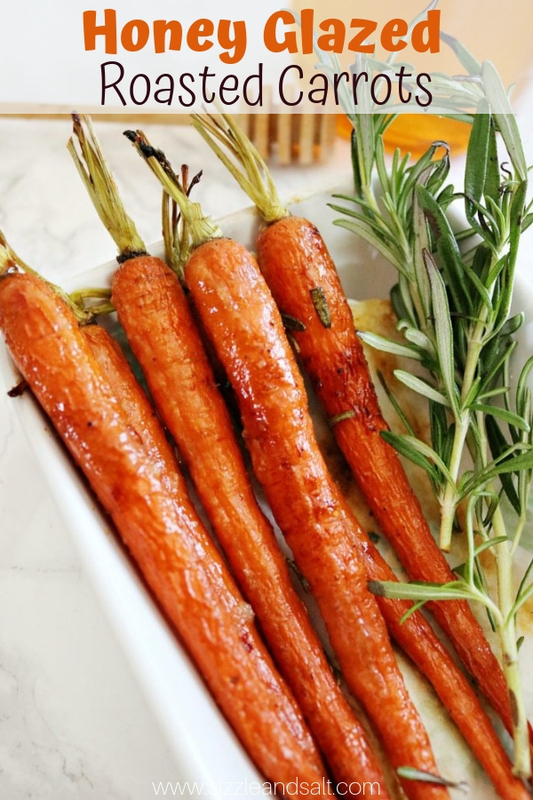 Our recipe for Honey Roasted Carrots with Rosemary is a must try. 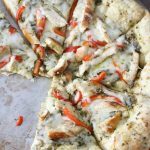 It’s a simple side that looks like it came out of a gourmet restaurant and tastes just as good. Fresh vegetables are a must for me with whatever meal I make. I love having a garden and being able to pick right from my own back yard. This recipe really celebrates the humble carrot in its natural, rustic form. The carrots are left whole, unpeeled and with greens on so there’s very little preparation. The carrots are then seasoned, roasted to perfection, and glazed with honey. Carrots are a great source of beta-carotene, fiber, vitamin K, potassium and antioxidants. They are linked to lower cholesterol levels, improved eye health, and have been linked to reduced risks of cancer. If you have never tried a carrot like this, you really need to! 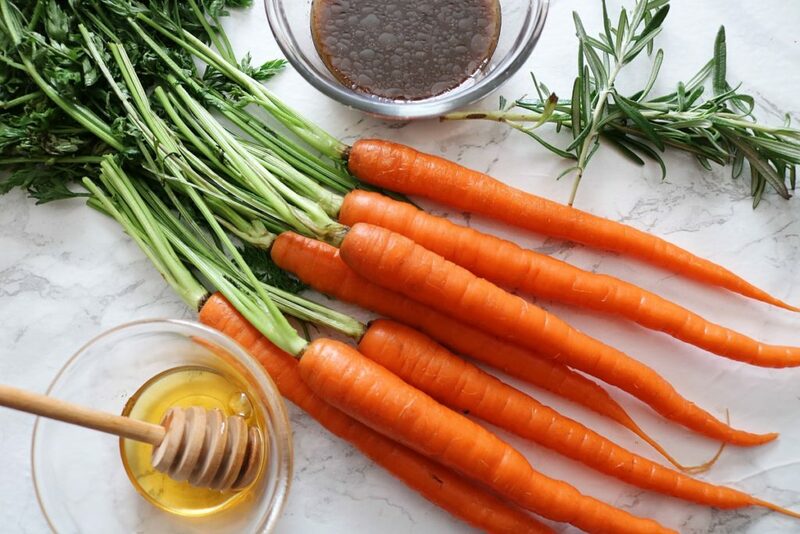 Carrots are one of those vegetables that are so incredibly versatile – a bit of seasoning and glaze, and this veggie is transformed into something completely new! 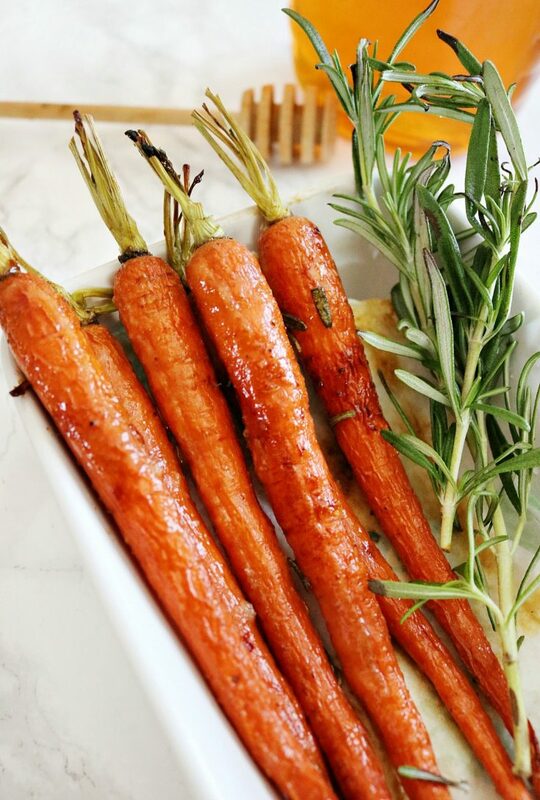 Our Honey Roasted Carrots are a sweet and savory side perfect for fall dinners, a beautiful addition to any holiday meal or even just as a snack. 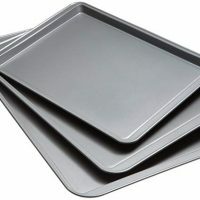 I am even willing to bet these will have little picky eaters loving carrots (and maybe even begging for seconds). For my low-carb friends, carrots are not known for being especially low-carb friendly. 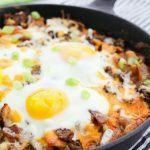 Each medium carrot is about 4.3g net carbs BEFORE you add on the glaze called for in this recipe. After glazing, the carrots come in at 8g net carbs per medium carrot. 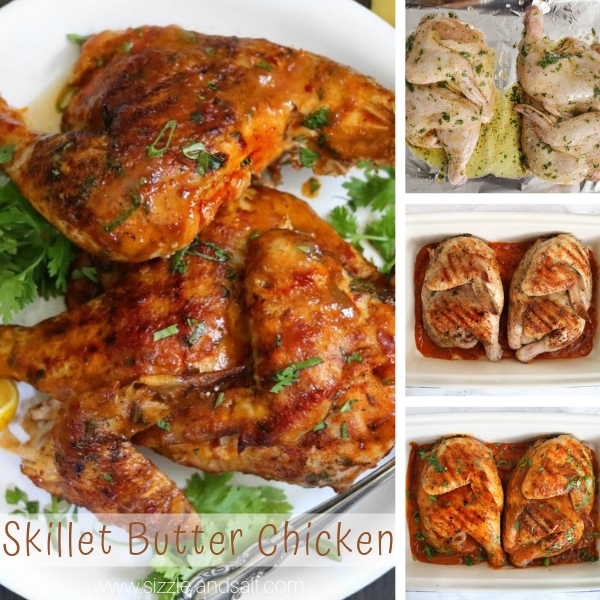 Scroll down to our free printable recipe card to get the exact measurements for this recipe. Trim the tops of the whole carrots to remove the curly ends (as they will burn). 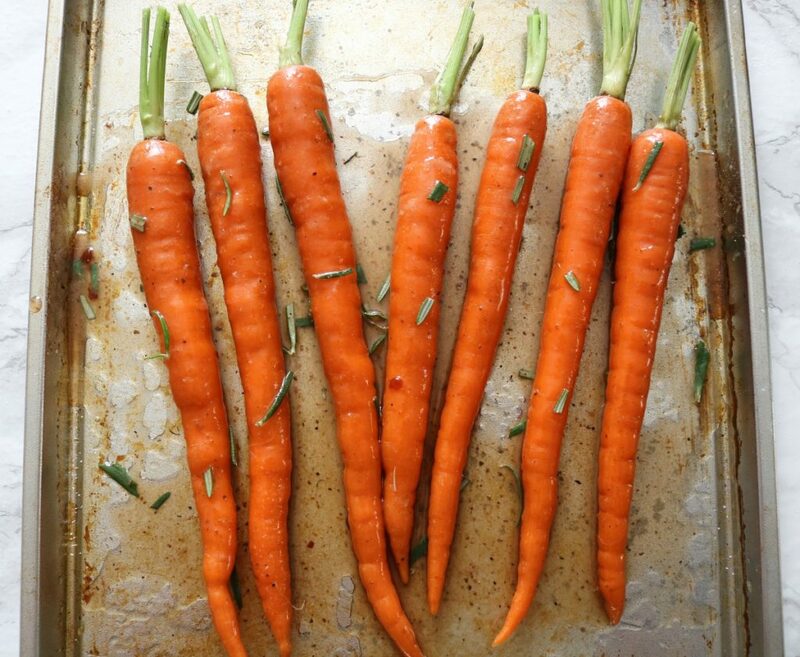 Place the carrots in a single layer in a sheet pan. 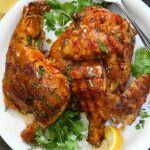 In a small dish, melt the butter and then combine with all remaining ingredients (paprika, salt, pepper, rosemary, honey, oil and vinegar). Brush or pour mixture over carrots, coating evenly. 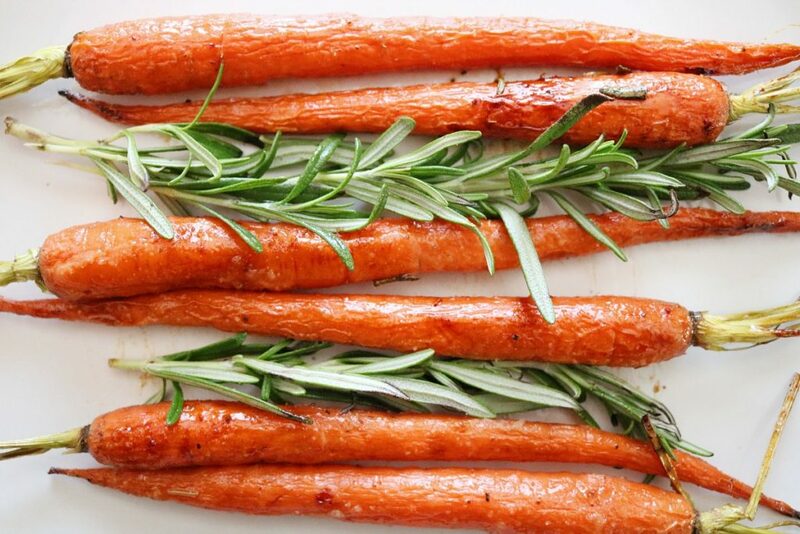 Roast carrots in the oven for about 15 minutes or until carrots are tender and achieve a nice caramelized color. Drizzle with more honey and a pinch of sea salt. 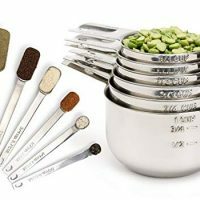 This recipe can be used for one to two bunches of carrots, depending on the size of the carrots used. 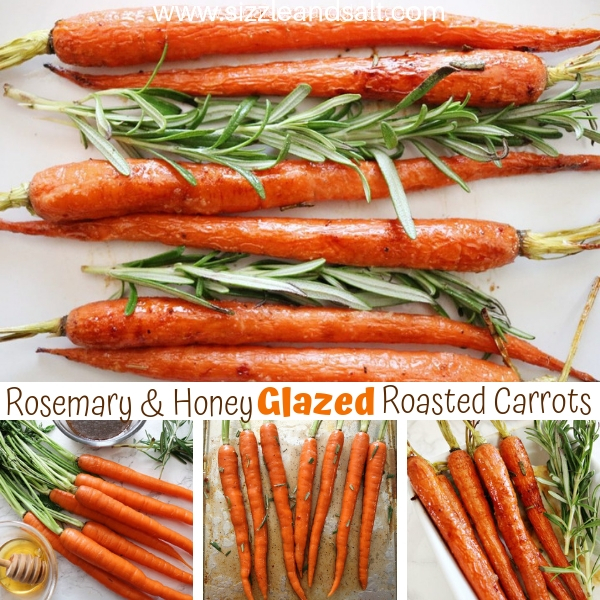 This honey glazed carrot recipe is super simple to make yet it makes such a flavor difference! 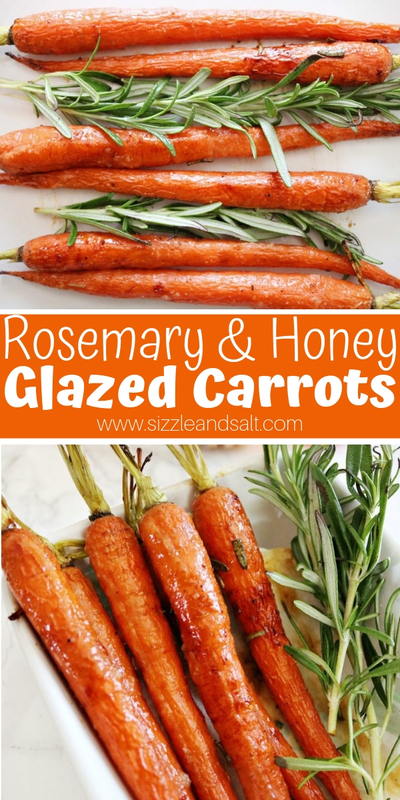 If you are struggling to get your kids to eat carrots, this may be the perfect recipe for you! 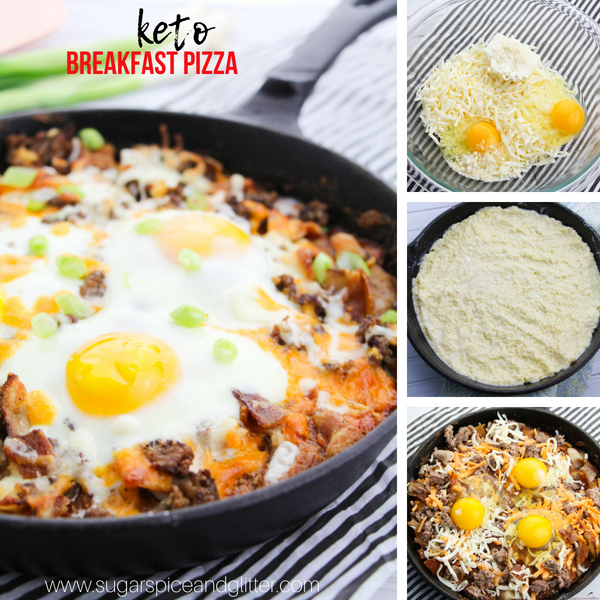 For more delicious oven roasted recipes, check out our Oven Roasted Butter Chicken or our Keto Breakfast Pizza recipe.